Glutathione peroxidase (GPx) (EC 1.11.1.9) is the general name of an enzyme family with peroxidase activity whose main biological role is to protect the organism from oxidative damage. The biochemical function of glutathione peroxidase is to reduce lipid hydroperoxides to their corresponding alcohols and to reduce free hydrogen peroxide to water. Crystallographic structure of bovine glutathione peroxidase 1. Several isozymes are encoded by different genes, which vary in cellular location and substrate specificity. Glutathione peroxidase 1 (GPx1) is the most abundant version, found in the cytoplasm of nearly all mammalian tissues, whose preferred substrate is hydrogen peroxide. Glutathione peroxidase 4 (GPx4) has a high preference for lipid hydroperoxides; it is expressed in nearly every mammalian cell, though at much lower levels. Glutathione peroxidase 2 is an intestinal and extracellular enzyme, while glutathione peroxidase 3 is extracellular, especially abundant in plasma. So far, eight different isoforms of glutathione peroxidase (GPx1-8) have been identified in humans. GS–SG + NADPH + H+ → 2 GSH + NADP+. Mammalian GPx1, GPx2, GPx3, and GPx4 have been shown to be selenium-containing enzymes, whereas GPx6 is a selenoprotein in humans with cysteine-containing homologues in rodents. GPx1, GPx2, and GPx3 are homotetrameric proteins, whereas GPx4 has a monomeric structure. As the integrity of the cellular and subcellular membranes depends heavily on glutathione peroxidase, its antioxidative protective system itself depends heavily on the presence of selenium. Mice genetically engineered to lack glutathione peroxidase 1 (Gpx1−/− mice) are grossly phenotypically normal and have normal lifespans, indicating this enzyme is not critical for life. However, Gpx1−/− mice develop cataracts at an early age and exhibit defects in muscle satellite cell proliferation. Gpx1 −/− mice showed up to 16 dB higher auditory brainstem response (ABR) thresholds than control mice. After 110 dB noise exposure for one hour, Gpx1 −/− mice had up to 15 dB greater noise-induced hearing loss compared with control mice." However, glutathione peroxidase 4 knockout mice die during early embryonic development. Some evidence, though, indicates reduced levels of glutathione peroxidase 4 can increase life expectancy in mice. The bovine erythrocyte enzyme has a molecular weight of 84 kDa. 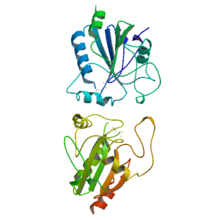 Glutathione peroxidase was discovered in 1957 by Gordon C. Mills. It has been shown that low levels of glutathione peroxidase as measured in the serum may be a contributing factor to vitiligo. Lower plasma glutathione peroxide levels were also observed in patients with type 2 diabetes with macroalbuminuria and this was correlated to the stage of diabetic nephropathy. In one study, the activity of glutathione peroxidase along with other antioxidant enzymes such as superoxide dismutase and catalase was not associated with coronary heart disease risk in women. Glutathione peroxidase activity was found to be much lower in patients with relapsing-remitting multiple sclerosis. One study has suggested that glutathione peroxidase and superoxide dismutase polymorphisms play a role in the development of celiac disease. ^ PDB: 1GP1​; Epp O, Ladenstein R, Wendel A (Jun 1983). "The refined structure of the selenoenzyme glutathione peroxidase at 0.2-nm resolution". European Journal of Biochemistry / FEBS. 133 (1): 51–69. doi:10.1111/j.1432-1033.1983.tb07429.x. PMID 6852035. ^ a b c Muller FL, Lustgarten MS, Jang Y, Richardson A, Van Remmen H (Aug 2007). "Trends in oxidative aging theories". Free Radical Biology & Medicine. 43 (4): 477–503. doi:10.1016/j.freeradbiomed.2007.03.034. PMID 17640558. ^ Bhabak KP, Mugesh G (Nov 2010). "Functional mimics of glutathione peroxidase: bioinspired synthetic antioxidants". Accounts of Chemical Research. 43 (11): 1408–19. doi:10.1021/ar100059g. PMID 20690615. ^ Ohlemiller KK, McFadden SL, Ding DL, Lear PM, Ho YS (Nov 2000). "Targeted mutation of the gene for cellular glutathione peroxidase (Gpx1) increases noise-induced hearing loss in mice". Journal of the Association for Research in Otolaryngology. 1 (3): 243–54. doi:10.1007/s101620010043. PMC 2504546. PMID 11545230. ^ Esworthy RS, Aranda R, Martín MG, Doroshow JH, Binder SW, Chu FF (Sep 2001). "Mice with combined disruption of Gpx1 and Gpx2 genes have colitis". American Journal of Physiology. Gastrointestinal and Liver Physiology. 281 (3): G848–55. PMID 11518697. ^ Olson GE, Whitin JC, Hill KE, Winfrey VP, Motley AK, Austin LM, Deal J, Cohen HJ, Burk RF (May 2010). "Extracellular glutathione peroxidase (Gpx3) binds specifically to basement membranes of mouse renal cortex tubule cells". American Journal of Physiology. Renal Physiology. 298 (5): F1244–53. doi:10.1152/ajprenal.00662.2009. PMC 2867408. PMID 20015939. ^ Ran Q, Liang H, Ikeno Y, Qi W, Prolla TA, Roberts LJ, Wolf N, Van Remmen H, VanRemmen H, Richardson A (Sep 2007). "Reduction in glutathione peroxidase 4 increases life span through increased sensitivity to apoptosis". The Journals of Gerontology. Series A, Biological Sciences and Medical Sciences. 62 (9): 932–42. doi:10.1093/gerona/62.9.932. PMID 17895430. ^ Mills GC (Nov 1957). "Hemoglobin catabolism. I. Glutathione peroxidase, an erythrocyte enzyme which protects hemoglobin from oxidative breakdown". The Journal of Biological Chemistry. 229 (1): 189–97. PMID 13491573. ^ Zedan H, Abdel-Motaleb AA, Kassem NM, Hafeez HA, Hussein MR (Mar 2015). "Low glutathione peroxidase activity levels in patients with vitiligo". Journal of Cutaneous Medicine and Surgery. 19 (2): 144–8. doi:10.2310/7750.2014.14076. PMID 25775636. ^ Sedighi O, Makhlough A, Shokrzadeh M, Hoorshad S (Sep 2014). "Association between plasma selenium and glutathione peroxidase levels and severity of diabetic nephropathy in patients with type two diabetes mellitus". Nephro-Urology Monthly. 6 (5): e21355. doi:10.5812/numonthly.21355. PMC 4318010. PMID 25695036. ^ Yang S, Jensen MK, Rimm EB, Willett W, Wu T (Nov 2014). "Erythrocyte superoxide dismutase, glutathione peroxidase, and catalase activities and risk of coronary heart disease in generally healthy women: a prospective study". American Journal of Epidemiology. 180 (9): 901–8. doi:10.1093/aje/kwu195. PMC 4207716. PMID 25156995. ^ Socha K, Kochanowicz J, Karpińska E, Soroczyńska J, Jakoniuk M, Mariak Z, Borawska MH (2014). "Dietary habits and selenium, glutathione peroxidase and total antioxidant status in the serum of patients with relapsing-remitting multiple sclerosis". Nutrition Journal. 13: 62. doi:10.1186/1475-2891-13-62. PMC 4080729. PMID 24943732. ^ Katar M, Ozugurlu AF, Ozyurt H, Benli I (2014). "Evaluation of glutathione peroxidase and superoxide dismutase enzyme polymorphisms in celiac disease patients". Genetics and Molecular Research. 13 (1): 1030–7. doi:10.4238/2014.February.20.4. PMID 24634124.